Hi everyone. 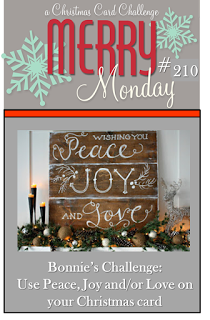 I'm playing along again this week at Merry Monday - Challenge #210 - Use Peace, Joy and/or Love on your card. Isn't this a great challenge ... I fell in love with the inspiration photo (as you can tell from my card). :) It's basically a copy of the photo. Great challenge Bonnie!! The square is cut from balsa wood and I "stained" it with diluted distress inks (Antique Linen and Brushed Corduroy). Then I heat embossed the small sentiment and die-cut the large joy twice, layering it to create a thicker die-cut. I die-cut my pine sprigs, added a little bit of snow writer, and then glued them along the bottom, layering several on top of each other to create depth. There's still a lots of time to play along, the challenge closes on Sunday at noon (PDT). Come join in the fun! And thanks to all that stop by for a visit, and a special thanks to those that take the time to leave me messages. Lovely card, Loll. Thanks for joining us again this week at Merry Monday. wonderful card Loll - love everything about it - looks like a winner to me!! Loll, this is amazing! I love the wood with the sentiment stamped on it! And those greenery look like the real thing..with a little bit of snow too! Thanks for joining us at Merry Monday! What a perfect take on the challenge! I absolutely love your card! The balsa wood is a great medium, and the Snow Writer is a fabulous touch. Fab take on the challenge Loll, love your snow covered foliage. A striking card, Loll, and the colored balsa wood is the perfect touch. You always have such unique ideas that make a card a WOW one yet simple and clean...true CAS design magic. I am so CASEing this card, Loll. Years ago I HAD to have the Martha Stewart pine branch punch and I'm not sure I've used it more than once. It would be perfect for this. I love the addition of the snow on the boughs. AWESOME, my friend! Just awesome! Gorgeous card, Loll - just live the wood panel with the pine sprigs!! You couldn't be more clever if you tried. This is an fabulous card. Clean, simple look with minimal but, oh so, important details, i.e., the greenery and that genius sentiment on the wood panel. I could go on and on, but I'll stop here. Another beautiful card, Loll. I like the simplicity of the "wood" panel over the busyness of a 4 pane window. Oh this is just perfect! Gorgeous! Thanks so much for playing along with us at Merry Monday. Not sure how I managed to miss this post, Loll, since your card is simply stunning. Congrats on your MM win! Loll...beyond fabulous...this one is a keeper! Just checked out the snow writer..very cool! Am ordering! Oh, how beautiful, Loll! 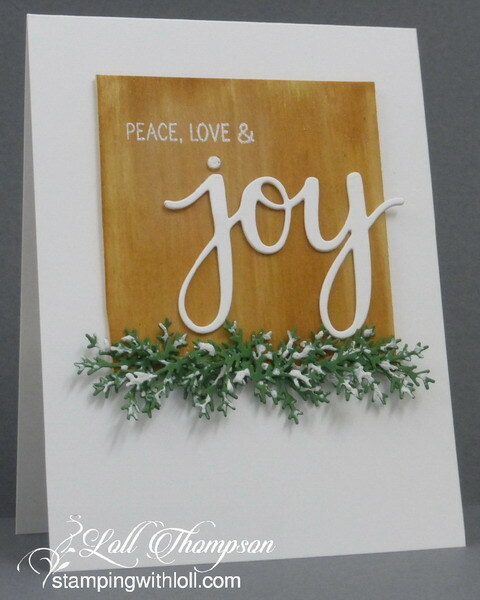 I love how you inked your wood square, and the snow capped wreath strip is gorgeous! Love your die cut sentiment, too...such a lovely Christmas card!